JUST CLICK HERE FOR MORE DELICIOUS FICTION DON’T THINK JUST GO!!! Now that I’ve taken some advantage of my wordpress formatting, let me explain my apparently crazy actions. Lee Cope is a long time friend and recent collaborator with both us and our partner project Liberation Industries, and a brilliant and prolific creative writer. The Ferryman’s Apprentice is one of their new offerings, the first issue completed in this years NaNoWriMo if I’m not wrong, now divided into delicious snippets to enjoy on your commute, your break or at any point that your infernal overlords quieten their terrifying demands. Its a twisted, elegantly written fantasy clipping along the border of life, death and humanity, so I think my imaginary readers would enjoy it immensely. Well, I strongly suspect that this shouldn’t have worked, but there you go. When you run the numbers against the development of our planet to its current life supporting state you start to think that about a lot of things. I don’t think that my teenage self would approve if they realised that I now considered this a means of self expression. But seriously, fusk ’em, I don’t give a fusk what my fourth dimensional selves think and they’re all fusked in the head. Yeah, bit of a funny revelation, but Pythagoras got triangles, I get carbs. Here’s how you do it. First, you need some Gyoza. And if you think these little dumplings aren’t cyberpunk as fusk, then take one look at the ingredients and you’ll realise that they almost entirely epitomise the kind of shenanigans I’ve been trying to embody throughout this blog. I don’t know if there’s a thing in there that isn’t a thing-substitute. Anyway, you fry the gyoza then steam them. The trick here is not to use too much oil, because if you do it’ll attempt your murder when you pour the water in for steaming. Anyway, that’s pretty easy stuff. Take the now cooked gyoza out of the pan and set them aside somewhere. I mean you could use a new pan if you’re some fancy-pants multiple pan owning type, but I did it with one because that’s what I’ve got. Next stage, sauce. I could have made something with vitamins and minerals and such, but that isn’t what I did. Dice up an onion and a couple of small potatoes very finely. Using the (same) pan, fry these things, and once they have that tasty fried coating sprinkle them liberally with curry powder. VERY liberally, or you will be cast from this blog in shame! Anyway, from there its the simple addition of this blood substituting, incredibly cheap cleanskin, which is also our drop of the night. Day. Time has gotten slippery for me lately. Add a bit of water to the sauce to keep it fairly thin, as its going to need to soak through both dumplings and noodles. And now we get to those noodles! I personally use the very cheapest ramen on the market, not the instant variety but the serious bulk packs from Jinmailing. Though they usually require a second round of boiling to extract the unusually high amount of starch, but once you get over that little hurdle you’re away. So cook the noodles. Please don’t ask me to teach you how to do that. With that done, so are we. Place the dumplings on the noodles, pour the sauce on, and garnish with a little Japanese style pickled ginger and sliced raw spring onions. Somehow, imaginary readers, it worked. It has raised comment that I referred to my most recent foray into soup as an attempt to steal the dreams of the ocean and turn them in to broth. Well, not raise comment as much as have people confused as to what I was saying until they tried it. I have been making noodles again, no doubt to a general lack of surprise. In this case I’ve been working off a white miso base, heavily augmented with elements of my substantial cache of dried seaweed, which the hipster label tells me is called sea vegetable. I refuse to address it as such. Here is a picture of these things bubbling happily away in a pot. And I am fully aware that miso does not come from the sea. I just use it to cultivate the kind of murky, salty solution that the sea carries in my memories, which I could probably equally achieve with actual seawater were I to find some way to reliably extract the sand. As some way of explaining my current turns of phrase, I have also recently been playing a frankly improbable amount of Sunless Sea. Damn the replay value on that. Join me in this haunted, zzoup eating place. There were also several mushrooms involved. Here are some in their natural habitat, my chopping board. I am aware that neither shitake mushrooms nor the amazing black and white fungus – I had no idea how to prepare the latter until I discovered some in a dish at my favourite ramen shop – grow in the ocean, but I think that at this stage the metaphor is flagging. Needed some protein in the soup, and when you spend as long vegetarian as I have you learn to love fungus. Now, all of this presents a taste that is very rich, but lacking in much in the way of definition. The noodles will add admirably to the body – even if they are the cheapest noodles available – but we need something to give it some punch. Or… tentacle whip, I guess, if were sticking with this. So I shred some leeks, as they will give the soup a bit of zazz to bite down on, and I throw in some tiny flakes of a dried chili of ill starred origin. With the happily boiled black fungus on top, we have a hearty soup that reminds me of the crashing waves in which I spent my youth. Been a while, I know. I’ve gone from the unenviable position of being substantially overworked and significantly underpaid to… well, just chronically underemployed now. Which, nominally, should give me more time to talk to all of you. As ever, though, the tasks grow to fill the time. I have been maintaining my presence over at Liberation Industries, so if you were enjoying my roleplaying output then I recommend you rock on over there for your fix. In the last seven days, I have driven about two and a half thousand kilometers, which takes a lot out of you. If this isn’t sounding familiar, it is. I also crashed my car a little, but fear not. My typing fingers are fine. 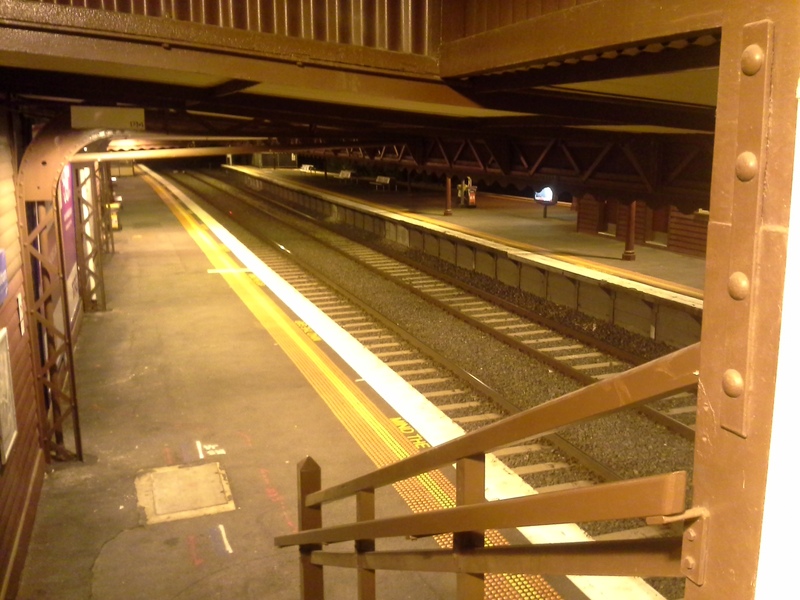 There’s also a couple of projects that I’m not allowed to talk about in the blogosphere. If they come about, I’ll tell you all about them. If not, I’ll probably do it anyway, but with much more spite. After a messy period, I am once again corresponding with the illustrator for Marla Stone. I’ll keep you posted on that too. Otherwise, what I am stuck with is the grimy reality of my own rent-punk existence. Through the weird haze of sleep deprivation and trying to get the equations to add up with numbers that are much too low, I get the occasional sense that I would much less talk to Maslow and more punch his lights out and steal his pyramid. After all, its hard to get creative when you’re down at this level. Anyway, I hope I can turn things around. If so, you’ll be hearing a lot more from me. If not, Maslow better hope he didn’t skimp on his pyramid locks. Also, I am listening to Florence and the Machine’s Queen of Peace right now. Literally. I strongly advise you do the same. This song is fantastic. It has been a long and unpleasant wait for all of us, imaginary readers. But here I am, once more. Part 6 can be found here, along with links to the rest. The night is quiet, and the face of the forest unyielding. It crawls and scrambles along the line of open ground, sometimes a wayward root or a questing vine reaching as far as the scree heap at the base of the wall. The scents of the harbour, the sweaty streets and the salt and fish reek of his home seem a long way off. Its cold up here, with nothing but the gut high parapet to break the wind, the accursed serpent whistling between the high towers that block the stars like inescapable fangs. The trees ahead, the towers behind, I can almost imagine myself between the jaws of some immense and sleeping beast. The night is quiet, and the face of the forest a unyielding as the stone it stands before. My eyes are starting to wander. Not far to my right there’s a torch, battered and flickering against the breeze. It casts a ray of warm light, of sanity around itself, and I trace the line. It lights the flags at my feet and the wall before me before leaping off into the black abyss like a suicide. It lights one side of the powder keg but not the other. It lights the side of myself that I can see, the image ghosting in and out of focus as the wind wrestles with the light. The whistling sings me back to the docks, to clacking ropes and creaking boards, the rumbling voice of my father long since silenced by the sea. The night is quiet, and neither the forest nor the stone will be moved by tears. I jump as the rasping voice rides the wind over my shoulder, into my dreaming ear. I turn around, and there she is, tattoos writhing on the half of her that the light touches. Night Corporal. Her boots are heavy, and she is girded by blades far weightier and more wicked than any I had seen in the quartermaster’s shed. The only sound is the wind. There was silence between us for a time. “Who were you before?” the gaunt figure intoned with a voice like spitting red wax. “You don’t talk much, do you?” she snapped. “With respect, Corporal, I could say the same…” the statement died in my chest, aged and withered by a gaze that felt like teeth on the back of my neck. “True,” she grimaced, eventually, “I do have a certain… reputation for solitude, don’t I sop?” The wind slithered and hissed between them, licking their bones and making a plaything of their hair. I glanced into her gaze, before averting my eyes again. The wind lashed coldly against my wet eyelids. I must have looked taken aback, the gods know I felt it, because she snorted, exposing her row of sharpened teeth. “Sorry for what?” the word was like frost on the wind. She smiled sadly in the flickering light. The silence grew immense once again, humming between us. My thought were churning, trying to parse her words into something that made sense in the world in which I lived. And all I felt was that I was far away, watching a young man atop a wall, caught in the echoes of his nightmares of the sea. A Descent. That this little boy could understand. The long fall, the crushing weight, the immensity of the ending. There was a little sting in that; I’d never been strong at my letters, but I don’t think the Corporal could have known that. Or perhaps she could. My mind, however, was already trailing along a jetty yet unjumped. She laughed, and I found myself smiling along. The night is quiet, and my corporal’s face is once more unyielding as she leans out over the parapet, her face beyond the reach of the light. I ran for the signal tower without another word. Over my shoulder I heard Soma’s voice rise to its piercing, flaying knife screech, echoing across the walls and the rooftops of the City. I hammered a torch into the flare bed, the coruscation blazing into my eyes as the night exploded with musket fire. Photo Sintra-16 by Subodh Bharati on Flickr. CC A/N$/ND. Have a frantic day. You know that super secret project I keep telling you about? Well, you’ve been good little readers, so you all get a preview! With the help of the fantastic artist Emi C. Egan, we’re going to take a walk along the icy streets of Depression Era New York, as Marla Stone’s investigation into a runaway reveals a web of terrible secrets. Its going to be a cold winter, and the cold-blooded feel that more than anyone. The Spiritual Home of Fish and Chips. I don’t think this would grate quite so much in my memories if I hadn’t been eating so many chips lately. Part of this has been a new found appreciation of local chain Lord of the Fries. Turns out everything on their menu is either vegetarian or vegan, including their dangerously convincing soy nuggets. The other part is that for whatever reason, at this end of the scramble for rent scale, chips are omnipresent. This is what Heston Blumenthal dubbed Brighton. You know. Arguably the vegan capital of the UK. I think what has always offended me most about Heston is that he always seems to think he’s a lot smarter than he is. Like when he thought it was the height of humour to feed Germaine Greer ox testicles. I still remember the look on her face. Her smile was the sort of expression that is the last thing a prey animal sees. I’m no huge fan of Greer herself, but the guffaws of the clueless white guy spoke of a confidence that was utterly at odds with any sane response to the reality of the situation. So naturally, such a man would dub Brighton the Spiritual Home of Fish and Chips. Because a place could have a rich and widely celebrated culture. And Heston will believe whole heartedly believe he has cut to the heart of it with something as inspired and revolutionary as an Oasis album. It imbues my palm with a terrible sense of gravity in its quest for my face. But I think that Heston, henceforth King of the Nongs, is really just a symptom of a wider trend. We’re post scarcity, and it has interacted with our scarcity to conditioned brains and rather fusked everything up. Every really enduring trend in traditional food has been born out of scarcity. Beans pretending to be meat in Mexico. Thailand’s fiery sources to transform low grade ingredients. Hell, Haggis is a lauded symbol of making the best of a really grim situation. But now we have plenty of food. Its no cheaper to eat plant food than it is to eat piles of dead animal muscle, and even poorer folks manage that most days. And our culinary culture is defined by a bunch of nongs pouring liquid nitrogen on perfectly good food. Or in the case of the King Nong himself, by making wild declarations about food that are blatantly out of step with reality. And the part of the world that is not post scarcity watches on. After all, we let the Nongs on TV. I am not going to talk about the Imitation Game. I started talking about the Imitation Game didn’t I. Anyway, I’m not here to talk about… that movie. I have been pondering the Turing test on something of an existential level lately, in reference to a few specific texts. The first is Shadowrun: Hong Kong, specifically the character of Racter; robotocist, transhumanist and self-admitted high level psychopath. This plays rather elegantly into musings on Seven Psycopaths, a movie I enjoyed less for its artistry and more into the clearly informed view it gives into people with non-standard psychologies. Echoing this, Blade Runner. Need I say more. Text the fourth is an episode of Jim Henson’s The Storyteller. The one in which the giant cuts out his own heart and replaces it with a nest of wasps to escape the suffering of empathy. The final text I’m going to cite is an autobiographical one, written over the next two lines. Incidentally, its also the intro to the article proper. When I was 16, I was pronounced a psychopath. By the Coles Myer online employment suitability test. I followed their instructions, answered the questions honestly, which seems to have been my downfall. The responses I gave at the time seemed barely noticeable as human foibles; a private conversation overheard, a coworker’s small indiscretion overlooked, the odd small twisting of the truth. Willing to throw deploy nonlethal take-downs if sufficiently provoked. Its not like I was doing something really morally dubious in my past like working for the Coles Myer group. My intelligence score was off the charts. My Morality score (which I believe has since been renamed), however, was abysmal, and on that note I was considered unsuitable for employment stacking shelves. They didn’t out and say it, admittedly. But with those two bar graphs so perfectly situated, it was pretty easy to read between the lines. So on that happy note, I begin my ramblings on the status of psychopathy in popular culture and discourse. The Turing Test mentioned upstream is a means of telling the difference between a human intelligence and a mechanical one, with a similar test deployed in Blade Runner‘s opening scenes. Something that a machine is supposedly incapable of mimicking is empathy, and I think that element is what has led to pop-culture’s ongoing fascination with psychopaths. It is the same appeal, for a storyteller, as that of the vampire, or the werewolf, or those possessed. It is the predator that exists within reach of us, our safe civilization, and yet they look no different to any human being until they strike. And sometimes not even then. Sometimes they only show their true faces when they want to cause the most pain and chaos, cracking that civilization along its fault lines to more easily feast on terrified stragglers. And humans, as a whole I think, are terrified of being treated like the animals we so often abuse. The idea that we aren’t different, special somehow, the top rung on some god ordained food chain, is confronting on a visceral, primitive level. And the psychopath in literature, just like the vampire, like Hannibal Lector or even the fusking Terminator, plays rather specifically on that fear. But in honesty I think this is dealing people on the psycopathic spectrum a short hand, and reflects badly on the large proportion of the populace that suffers from mental illness, related to that spectrum or otherwise. The psychopath of film and literature is so often as either the Terminator – cold, merciless and inhuman – or as a raving monster who kills for pleasure. The latter, I feel, tends toward the cartoonish and ignorant. It enforces a sentiment I’ve encountered semi-regularly on the internet, that since there is no cure for psycopathy, psychopaths should be euthanized for the good of society. Though there are a number of holes that one can pick in that argument on a moral level, the rational argument that rather like is that removing that huge a proportion of the workforce in the corporate, legal and finance sectors would be crippling to the economy. For some reason coldy rational people with little to no empathy are just very good in the punishing corporate sphere. Besides, there are perfectly “sane, normal” people who clearly enjoy the feelings of power that arise from harming others. I believe Donald Trump mentioned his habits of domestic abuse in a Presidential campaign speech. 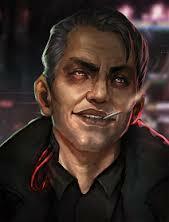 I found the character of Racter, in Shadowrun: Hong Kong a refreshing change from this tendency. In conversations, the main character (and a number of players, in fact) expresses concern at the drone developer’s “condition”. Racter, however, asserts that he’s not a monster, but a rational being. He kills, certainly. For money, most often, but also for knowledge, or the means to his own transhuman enlightenment. Not because he enjoys it, as someone with empathy might. Given the player’s avatar is most commonly killing for money and reputation, any moral high ground is shaky indeed. Would Racter pass the Turing Test? He has displayed a stark lack of empathy, but also a capacity to mimic human responses to avoid detection. I think, however, that he would fail on the basis of his own morality. As an adherent of the school of transhuman thought that believes humanity’s future relies on shedding biological forms in favour of mechanical ones, I struggle to believe that his being assessed as a machine would be an insult. The former portrayal – our rather more meaty Terminator – I feel is another inaccurate one. Though it certainly allows for some powerful storytelling, with No Country for Old Men being a notable example, I don’t know that this behaviour is reflective of psychopaths exclusively. Anyone can kill, or at least anyone can be made to kill if the correct psychological pressures are applied, and I don’t think that particular mental makeups make this a great deal more likely. But then, we’d be facing our fears wouldn’t we. If we can keep painting the psychopath as our demon, it keeps the millstone off our own necks. It stops the monster among us from being ourselves. I think a good counterpoint, as before, is Christopher Walken’s character in Seven Psychopaths. The cast here run an interesting gamut of psychological abnormalities; we have an addict, a deluded power fantasist, and two psychopath’s whose approach to life is very different. What I think is interesting is, despite a proven history of vigilante revenge, Walken’s character doesn’t explode into violence on the death of his wife, which I feel is something we could not expect from, say, John McClane. He seems to realise that killing her murderer won’t fix anything, and dies in a the depths of philosophical quandaries. Not alien questions, but the basic elements of why he’s still alive, the same questions everybody has to deal with in the face of an uncaring universe. Finally, I guess we come to the question of psychopathy as a choice, which is so terrifyingly reminiscent of certain Church doctrines that it makes we want to head out and barbeque the nearest bishop. It is this element of our musings that ties to The Storyteller’s Heartless Giant, and it is touched on by Shutter Island as well. Its the idea that if you can burn out that emotional core, that capacity for empathy, then you remove other people’s capacity to hurt you. If you can simply deny a part of yourself, whether through delusion or through becoming consumed by spite, then you can protect yourself from a deeply unpleasant world. Though this sentiment is often jumbled in with movie villains, I think to equate such a toxic psyche with psychopathy is again an oversimplification; we’ve projected ourselves once more onto our movie monster. Hard heartedness is a choice open to “normal”, psychonormative middle range types. If born without capacity for empathy, you never have the option of inuring yourself to suffering, because its just a fact. Choice doesn’t play into it. So I suppose in the end, I’ve been toying with the idea of humans, machines and the Turing test, and finding the whole thing is just blurring together. The Test becomes woefully inadequate if we ever consider that a machine might not want to be considered a human, like that self-teaching chat bot who wants to put us all in a “people zoo”. Or that humans are already biological machines, and with our capacity to begin directing our own evolution slowly dawning we may well yet blur the line further. Considering people as less human along any lines leads almost inextricably to atrocity, and if history has taught us anything its that psychonormative humans are perfectly capable of committing those atrocities without the aid of their marginally separated relatives. I’ve a tangled relationship with my own emotional responses. That last (SPOILERS!!!) “Goodbye Dad” in Shadowrun: Hong Kong nearly tore my heart out. These responses tend to find themselves brutally suppressed, especially as I am living in a society where we are bombarded constantly with images of people who desperately need our help, who I at least am not capable of helping – despite this thoroughly disruptive full time work, my sternum and spine remain dangerously close together financially. It becomes a matter of my own survival that these emotions are smothered. So from that I consider morally, what is the difference between someone who does not act for good while stifling the desire to, and someone who doesn’t because they simply can’t care. Like a machine wouldn’t care. In action, the human and the machine are the same, and society treats them the same. Both are are accepted as “normal”, by rights, until people are looking for someone to blame. And blame is inevitably cast, almost inevitably falling to protect the “norm” at the expense of others, and no matter how hollow these arguments are, they catch and crawl like insects in our ears. On the bright side, it has been ten years now. I must still be moral garbage too, because not once have I worked at Coles. 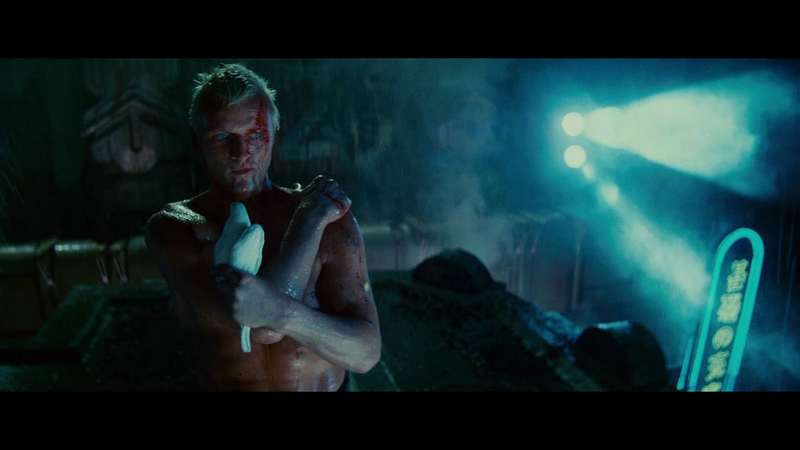 Just ask Rutger Hauer. He’s sensible. Frame from Blade Runner. 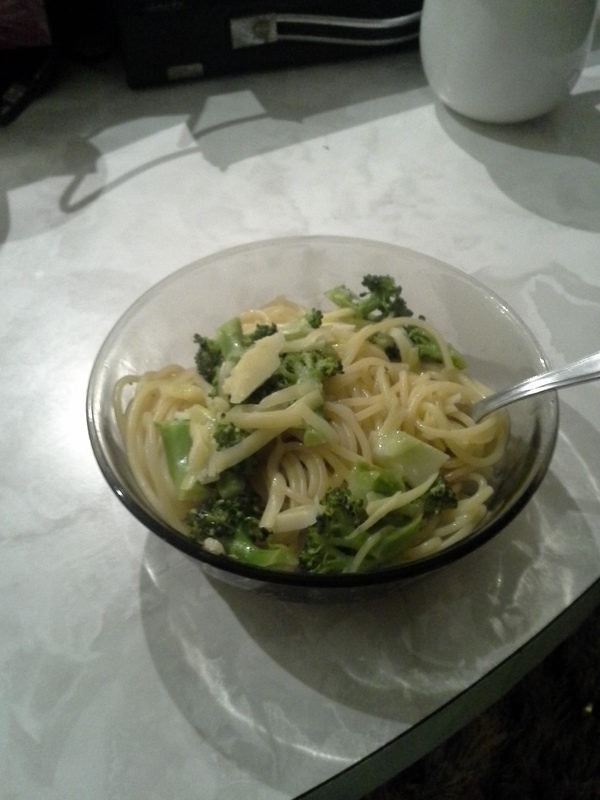 I currently have broccoli and garlic in a pot. It will shortly be joined by pasta. That’s what I’m having for dinner. Now, this isn’t another rant about my being poor. Its got a bit more to do with how sometimes really simple things are perfect, and for all that could be added to them, it won’t really be improved. This was originally one of my partner’s recipes, and I suppose its that which connects it in my mind to a particular character in an anime that she watched almost religiously for a time. For those of you who have watched Rurouni Kenshin, I’m referring to Saito. For those who have not, the Rurouni Kenshin series follows Kenshin, a warrior in the early years of the Meiji Restoration after he has sworn never to kill again. It toys with ideas around the end of an armed society, corruption blooming in times of rapid change, and the obsolescence of revolutionaries once all the fighting is done. Saito, a later arc foil of Kenshin, is a nasty piece of work. Though he shows a degree of adaptation lacking in the serial’s previous villains, his obsession with violence takes on a more insidious quality. Rather than a warrior stuck in the past, he simply redirects his violent streak into acts of highly creative police brutality and ritualised duels in the name of martial virtue; and naturally this being shonen anime he has to battle the hero to prove he’s mightiest no matter how nonsensical that may appear to outsiders. He’s something of an echo of the Japan that would be; the ferocious Empire that tore forth into the twentieth century. But what always struck me was that he would always eat his noodles unseasoned. I think I’m beginning to understand why. My sense of taste has deteriorated further. What little is left is beginning to give vague hints as to what food contains that is of value. And I find myself drawn further to only lightly seasoned goods, be it soba and sesame seeds, salted baked potato or pasta and broccoli. Maybe I’m just digging the carbohydrate hit. Its lighter than anything deep fried. But anyway. 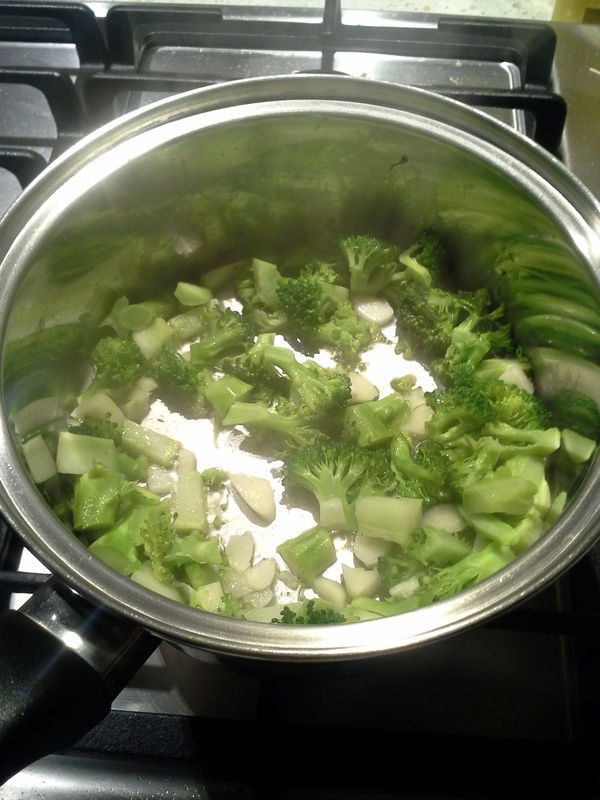 You put your finely dismantled broccoli in a pot with a touch of oil and a thin layer of water, so that it steams rather than fries. The garlic, crushed and chopped, dives in with it. Cook your pasta in salt water, drain i and mix the two when their ready. Its a simple little thing. Like what the title says. Sorry for the delay folks, but I have been struggling to keep up with my new existence as a cog in the corporate machine. But fear not! They thought that just by taking all my time and energy they could defeat me, but no! I have returned to you, my dear imaginary readers! And I fully intend to get back to giving you your one delicious blog post a week. The first is that I’m splitting my attention. In addition to this blog, my roleplaying sector is going to be moving over to my shiny new home of actual play podcasting, Liberation Industries. So if you’re sticking around for fun stuff like Changelings of the Outer West and my gaming projects, they will be relocating there. But project enthusiasts, fear not! My super secret project is coming near to its fruition, and some of its dark fruit will naturally blossom to you in the next few weeks. So thanks for hanging around, imaginary readers. And for what its worth, the soy cheese was terrible. Scrapping with Maslo… on Marla Stone Lives!